I am back in the office and ready to help you with any historical questions and/or assistance in determining what should be sent to the archives. The primary goal for the Oral History Initiative will be to conduct high quality, well researched oral histories of past and present members of the AHC community. The focus will be on the interviews. John Eyler explained that his choice for a candidate to fill the oral historian position would be a qualified historian of medicine or medical science with a special interest in the history of medical/health care institutions. If hired as a tenure track faculty member, the position would attract a talented scholar and build the incentive to remain at the University and complete the project. Three primary concerns regarding a tenure track position centered on 1. the academic currency required to satisfy tenure for such a position; 2. the need for the position to remain focused on creating an extensive collection of oral histories and not to become too focused on a particular aspect too early on in the project; and 3. the oral histories would need to be available to all researchers as completed and not at the end of the tenure cycle or writing process. The discussion focused primarily on ways to satisfy the tenure requirements. The position would need to have a reduced teaching load and instead would focus on research (the oral histories). Publications would be primarily based on articles developed from the project and the finalized transcripts of the interviews. These transcripts would include scope and content notes and provide a historical context for the interviews. The other concerns could be satisfied by incorporating them into the position description and making them part of the tenure process. Next steps: John Eyler, with assistance from other members of the advisory committee, will look into the academic requirements to satisfy tenure in oral history. Once a satisfactory tenure plan and position description are put together, they will be reviewed by Dr. Cerra. Erik Moore distributed and discussed a list of potential items to digitize and make available online for the History Project. The materials include studies and reports leading to the re-organization of the Health Sciences and the formation of the Academic Health Center, archival records and reports pertaining to the management and operation of the University Hospitals and Clinics including the minutes for the Board of Governors, the full run of the Bulletin of the Medical School (now the Medical Bulletin) beginning in 1929, and several oral histories conducted by Ann Pflaum in 1999 with prominent leaders of the AHC. Erik explained that these materials along with the digital preservation of current AHC Strategic Positioning documents in a single online repository would provide researchers with material that documents the AHC’s planning activities over the course of fifty years. Dr. Cerra added that many of the electronic files that could be added to the repository are available from the Office of Communications and even his own electronic files. Plans to capture that data will also be part of this process. All were supportive of the list and suggested additional areas for growing the digitization project. Erik will continue to develop the list and will review it with Dr. Cerra in July. A budget for digitization has been set aside and scanning can begin shortly after the initial priorities have been established. All committee members who were able to attend the round table discussion held Feb. 21 agreed that it was both a success and a model for future discussion groups. Sarah Evans noted that some of the advantages to the group format included participants’ ability to spark ideas among the others present, allowed for the juxtaposition of differing experiences, and held all participants accountable to each other. Erik Moore added that Dr. John Kersey (a round table participant) remarked that the group format kept them all honest. Committee members then discussed the advantages of conducting similar round tables in the near future and variations in terms of the invitees and topics discussed. A discussion group focused on faculty would aid in establishing an intellectual history of research conducted at the AHC. A round table focusing specifically on the schools and colleges would highlight the issues surrounding education. A discussion focusing on the interdisciplinary centers would focus on the working relationships between disciplines in the AHC. The committee then discussed the potential outcomes of additional group interviews. One outcome would be a broad understanding of AHC issues from varying view points. Another outcome would be the use of the interviews to follow up with individual interviews for many of the participants. Finally, several participants could be invited back to have a similar conversation in a more public forum. This would be an interesting product of the project, one perhaps loosely based on the “Great Conversations” model. Jennifer Gunn has a copy of the DVD of the round table. A copy still needs to be delivered to the archives. Several committee members were able to attend the Gretchen Krueger speaker event and official launch of the AHC History Project (Feb. 28). Dr. Frank Cerra, Jennifer Gunn, and Erik Moore all delivered brief remarks at the event. Erik Moore reported being approached by several people after the event interested in either discussing AHC history in more detail or wanting to learn more about how to donate relevant materials. Several committee members volunteered to help gather information needed to make a formal oral history project plan. Erik Moore and a sub group of the advisory committee will gather the information and compile a proposal for Dr. Frank Cerra to review. The plan will include a listing of potential interviewees and topics to cover, sequence of interviews, equipment specifications, and budget information related to conducting the interviews, purchasing equipment, and creating transcripts. It was agreed that an additional benefit from the round table discussion and future round tables will be a foundation for the individual oral histories. The person(s) who will eventually conduct the individual interviews can use the group discussion recordings as a means to become versed in the AHC history and understand the context of events. A discussion about digital access to materials gathered during the project included a brief overview of the University of Minnesota Digital Conservancy (http://conservancy.umn.edu), the need to establish priorities in what would be digitized and how those items would be made accessible, and the pros and cons of various digital asset management systems and how they could be employed. Below are the remarks I delivered as part of the introductions at the AHC guest lecture by Gretchen Krueger. The event doubled as an opportunity to formally launch the AHC History Project. Welcome. I appreciate your interest in tonight’s event and would like to take a few moments to elaborate on the project that I am working on. 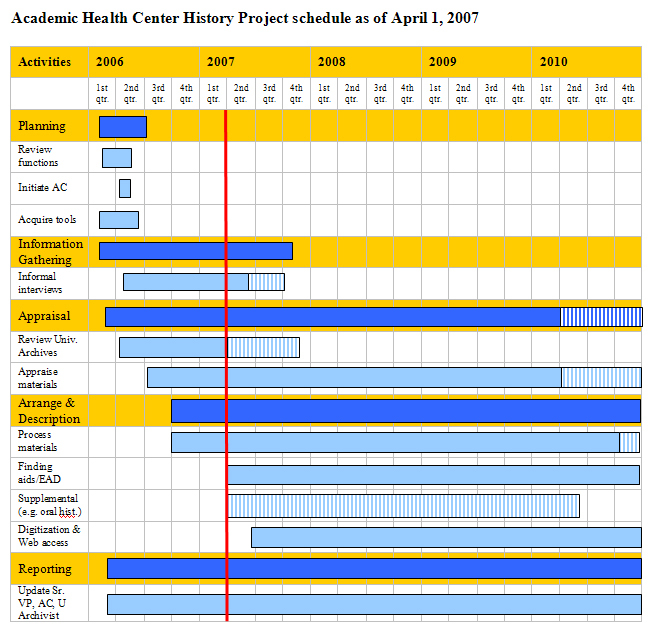 The Academic Health Center History Project is a unique collaborative effort between the Academic Health Center and the University of Minnesota Libraries to ensure that the rich history of the Academic Health Center is preserved within the University Archives. 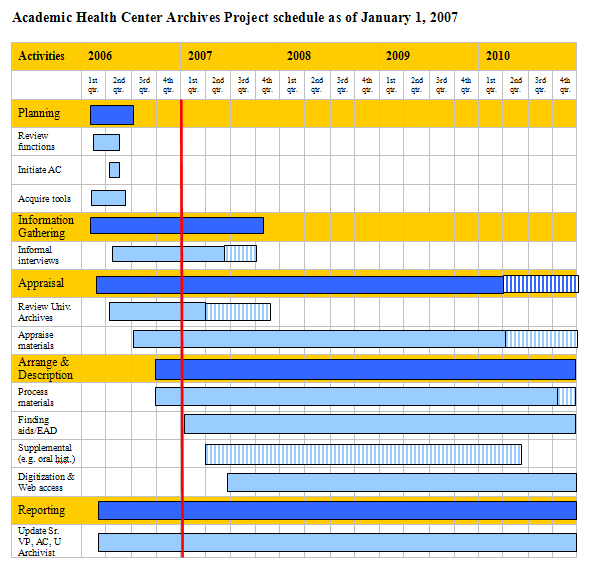 The goals of the project are to identify, collect, and provide access to the institutional and historical documentation of the Academic Health Center, its six schools and colleges, and its interdisciplinary centers at the University of Minnesota. The outcome is to ensure that this valuable documentation is preserved over the long term and made permanently accessible for scholarly and administrative uses in the University Archives. However, where I’d really like to begin is by quoting Dr. Cerra from his State of the AHC address delivered in this auditorium last month. Speaking about ways to support current research, Dr. Cerra reminded the audience that “There is a repository of wisdom in our faculty… We need the wisdom of those faculty and we don’t really have a good system for tapping it and using it.” I understand this wisdom to be broader than the traditional model of publication. It is a wisdom that comes from experience and personal interrelations. Dr. Kennedy was well aware of the repository of wisdom faculty could be and he made great progress in being a source of information for others. But I hasten to add that this project is not about faculty alone. The administrative units of the AHC, its schools and colleges, and centers are all repositories of wisdom that need tapped as well. A better institutional understanding comes from a well-documented institutional history. Without which, there is little or no context for the work being done. It is not only researchers who are prone to reinvent the wheel. We re-visit familiar ideas in our strategic planning, curriculum design, and clinical operations year after year. Dr. Kennedy once said, “My favorite expression is that medical oncology is the practice of internal medicine, but all the patients happen to have cancer.” Dr. Kennedy believed in a comprehensive care approach. Why combat the cancer if the onset of additional health issues were left unchecked? It is like sticking your thumb in a hole of a cracked dike and ignoring the mounting pressure of water on the other side. To date, the attempts to stop the loss of history at the AHC have been something closer to the thumb-in-the-hole method while the mounting pressure of lost history grew. With the AHC History Project we are gathering partners together to stop the loss. As you have heard there is an institutional commitment from the AHC and the University Libraries to preserve this history and make sure there is access to it. But on the other side of the table are you: the faculty, administrators, department heads, administrative staff, students, and family. You are part of this project as well. You are the people who understand the history by living through it. We will need your help at locating it and bringing it out into the light so that it can be preserved and others can have access to it. You are part of our insurance against the dike breaking. Thank you for coming tonight. Your interest in the AHC’s history demonstrates that we have a great foundation for us to develop this project and see the repository of wisdom of the Academic Health Center built. As part of the project’s relationship with University Archives, monthly activity reports documenting collection surveys, accessions, processing, and faculty contacts will be submitted to Beth Kaplan, the university archivist. Erik will also send an electronic copy to Dr. Cerra and to the members of the advisory committee to help keep all parties informed on latest developments and materials collected. Erik began the discussion on the oral history component by reviewing some of his research into the supplies and documentation needed in order to conduct a successful oral history project. 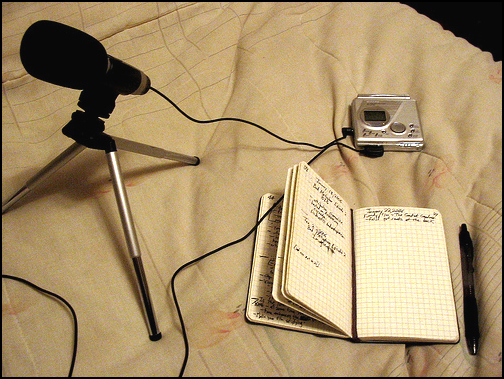 In regards to equipment, the preferred method of recording will be with a video camera and external microphone. It will be necessary to purchase or rent a “broadcast” quality camera, meaning an equivalent to video that is produced for television footage. Another important area to budget for will be transcription services for all recorded interviews. A well-edited transcription will serve as the primary access point for researchers interested in using the oral histories. Transcription services are approximately $20 per hour. Plan to budget for 4-5 hours of transcription per recorded hour of interview for a total of $100 per recorded hour. Erik, Prof. Eyler and Dr. Cerra have all been in touch with DJ about the possibility of being part of the oral history project. He has expressed his interest but is unsure of how much time he is willing/able to commit. The discussion then turned to the possibility of having multiple interviewers. DJ could begin the project as a consultant and then perhaps a full-time person can be brought on board to continue his work. Dr. Cerra asked Prof. Gunn and Prof. Eyler to help determine what a job description for that kind of person would look like and what would be needed to budget for such a position. Next the discussion focused on the need for IRB approval and the need for consent. Oral history projects at the University of Minnesota generally require IRB approval and can usually be considered as expedited reviews. IRB reviews are required for video and voice recordings as well as for interviews with people in a protected class, in this case some of the interviews will be with people considered to be a part of an elderly population. Dr. Cerra suggested it would be best to follow up with MK to better understand the full requirements. Dr. Cerra expressed the need for consent forms for each of the interviews and believed the IRB or AHC Counsel would be able to provide assistance. David Rhees noted that we need to be sure to have all copyrights signed over in the consent form. The final aspect of this discussion centered on how to actually start the process. First, the creation of a time line of AHC history would help inform an interviewer. A list of potential people to interview would also help shape the project. Finally, a draft of questions would be helpful, although the questions cannot be finalized until the interviewer(s) is known and has his/her input. It was also suggested that it might be helpful to interview a group of people together and allow their conversation to help guide the direction and focus for the oral history project. A speaker event with Gretchen Krueger is planned for February 28, 2007 from 4:30-5;00 pm in the Mayo Memorial Auditorium. The topic will be on the history of oncology at the University and the work of Dr. B.J. Kennedy. The speaker event will also act as a means to kick-off the AHC Archives Project and make others aware of the project across the AHC. 4. How to make others (AHC faculty, staff, archivists, etc.) aware of the project? Erik is keeping a project blog: http://blog.lib.umn.edu/moore144/ahcarchives/. This is intended to help disseminate information about the project. It is also a means to document the creation of the archives and allow transparency for the process. This will soon be linked to the University Archives web site and can also be linked to the AHC web site (homepage?). 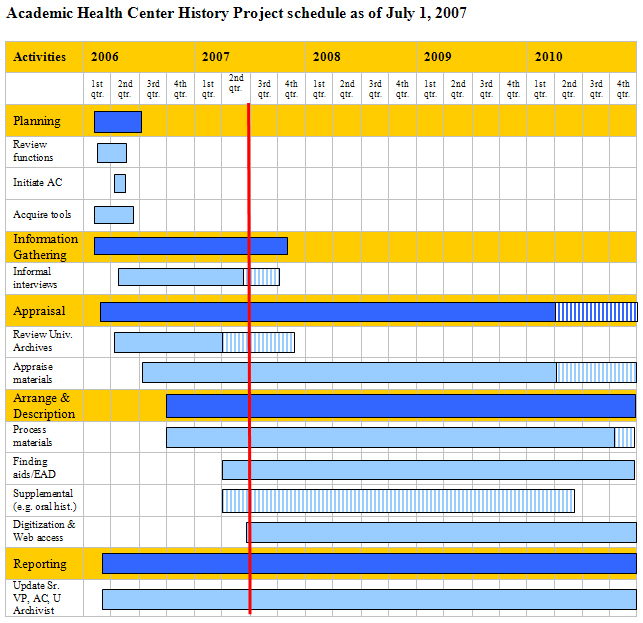 Other means of informing people about project activities might include a weekly update in the AHC News Capsules and possibly a small article or write up in the publication Pictures of Health. The University Archives will soon be featured on the University’s homepage and can include language that draws attention to the project.